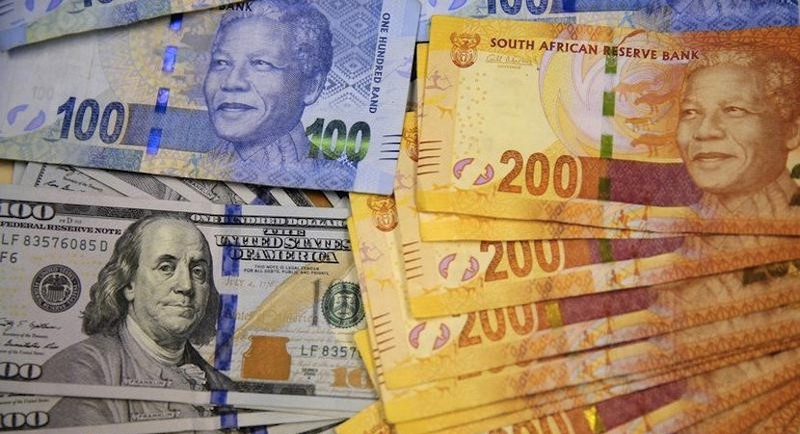 Cape Town – The rand was edging down to R14 to the dollar on Tuesday after one rating agency demoted South Africa to junk status and another placed it on downgrade review on Monday evening. South African bank notes featuring an image of former President Nelson Mandela are displayed at an office in Johannesburg. The rand, which has lost 11% of its strength in the last seven days, was rattled by the downgrade by Standard & Poor’s as well as the move by Moody’s to place South Africa – which it has two notches above junk – on downgrade review. It lost over 1.5% in the last 12 hours, during which time these actions were taken. By 08:07, it was trading at R13.93 to the greenback. Umkhulu Consulting analyst Adam Phillips said that the turmoil experienced before the rating agencies’ decision was because “we are starting to see the rand behave like a below investment grade rated currency”. Following the downgrades, he said South Africa should “expect to see the rand move up closer to R14/$ and by similar moves against the third currencies”. He believes other rating agencies will downgrade South Africa to junk status, but even if they don’t, traders will act on S&P’s downgrade. “It does not matter if they only go down by one, as bond investors will take their cue from S&P,” he said in his morning note. However, some economists expected the rand to perform even worse, with some predictions seeing it weaken to R15.50 to the dollar. Economist Dawie Roodt told Fin24 he believes the ratings downgrade was priced in already.